Lava Lamps are classics. Perfect on your desk, in your living room, kitchen anywhere really so when the Mathmos Smart Astro LED Lava Lamp came in through my door I was very excited. The size of this thing is huge compared to my previous lava lamps. The exterior material used on the base is polished aluminium and looks very slick indeed. The glass lava bottle is of course positioned on top of the aluminium stand. The actual lava takes around an hour to get a little wobbly. The method of heating the the lava is radically different to other lava lamps which I own because they all use light bulbs. But the Smart Astro uses electricity to heat up a plate which the glass bottle sits on. It also has a temperature sensor to fully control it. This really is a lava lamp from the future. The colors vary on the Smart Astro with two different models. One model goes through blue to red cycles and the other goes through green to yellow. I have the blue to red model and it looks great. The LED’s are bright and vibrant and the transitions from color to color are flawless and a joy to see. LED’s also service economical sense with them consuming practically no electricity at all compared to having a bulb in a lava lamp. The controls are very easy to use. On the bottom of the aluminium base we see whats called a ‘Smart Button’. This is a touch sensitive button which works flawlessly. To turn on the lamp simply touch the button for a short duration. Once on you can touch briefly and the lamp will stop at the color it was on, touch again and it will resume it’s color cycles. To turn the Smart Astro off hold down for 4-6 seconds and once the LED’s dim remove your finger. Very straightforward which is perfect in all lifestyles. 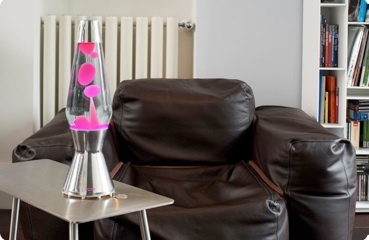 Overall the Mathmos Smart Astro lava lamp is a revolution in lava lamp technology. Beautiful colors, economical, easy to control, wonderful design and it’s manufactured in Britain. 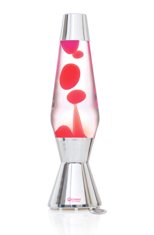 Why would you even consider buying any other lava lamp?